With the FIFA World Cup tournament in Russia in full-swing, billions of people around the world are cheering on their national teams as they do battle for the biggest prize in international football. As the drama on the pitches across Russia was being played out, European leaders met to respond to mounting pressure to come up with a solution to Europe’s migration crisis. Some are pushing to tighten Europe’s borders, or close them to migrants altogether. One irony that may have escaped those politicians, and football fans too, is that many of the players pulling on the jersey of their national team were born outside the country they play for with such passion. Almost one in ten players in the World Cup were born outside of their country. There are 1,032 players involved in the tournament. Of those, 98 were born beyond the borders of the country they are representing. While only 11 players represent the team on the field at any one time, a national football squad can encompass 40 or more. 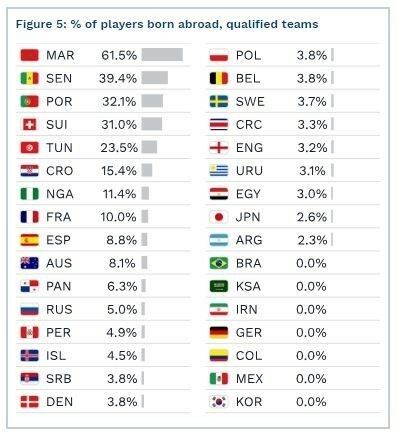 Morocco has the highest proportion of foreign-born players, with 61.5% of players born abroad. Senegal’s team contains 39.4%of players born abroad, and Portugal fielded 32.1% foreign-born players. 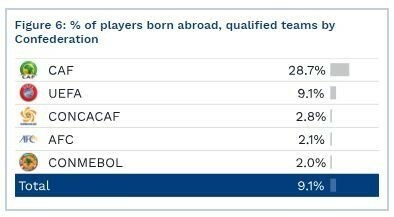 Brazil, Germany, Mexico and some other countries had no players at all born abroad. When we look at regional football associations, The Confederation of African Football (CAF) has the highest proportion of players born abroad, and UEFA - the European Association - has the next highest at 9.1%. On average, 9.1% of players in the five regional leagues are born abroad. The vast majority of players taking the field in national leagues are playing outside their own country. Perhaps one of the most famous migrants in football is Cristiano Ronaldo. Born and raised in Portugal, he has played in the English and Spanish leagues for most of his professional career. Mohamed Salah is an Egyptian-born player whose last minute goal helped send Egypt to the World Cup in Russia. He too plays in a foreign league - the English Premier League. 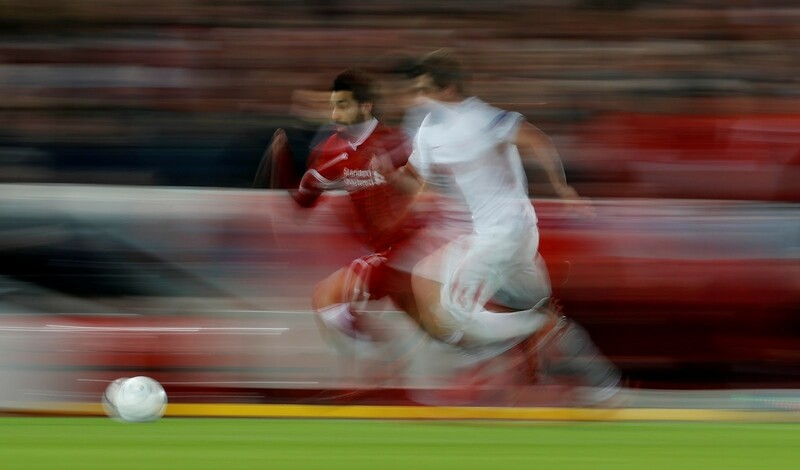 In 2017, Salah became the first Egyptian footballer to be named the Professional Footballers' Association Player of the Year. Every one of the players representing Croatia, Sweden and Iceland at the World Cup play in leagues outside of their own country. Senegal, Serbia, Belgium and Nigeria all have players signed by clubs outside their own country. 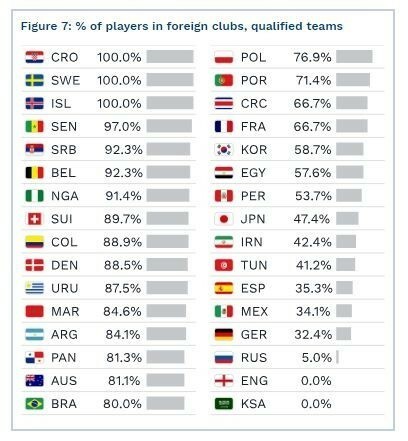 The percentage of players playing in foreign leagues ranges from 97% to 91.4%. The global average is 64.6%. And yet, while their achievements on the pitch are greatly celebrated, off the pitch (or sometimes even on) migrant footballers can suffer extreme racism. Swedish midfielder Jimmy Durmaz became the subject of racist abuse on social media after he gave away the free-kick that led to Germany’s win. The Swedish Football Association reported the abuse to police on behalf of the player. Switzerland’s national team coach Vladimir Petkovic points out that cultural diversity is the secret to Swiss success. "We have managed to bring together different cultures, different talents, different ideologies and they help us to play really good football," Petkovic told a news conference.